Rollers: Constructed of 1-3/8" dia. x 18 gauge galvanized steel, with smooth swaged ends. Roller capacity is 50 lbs. Axles: 1/4" dia. galvanized steel shaft, spring loaded. Couplings: Hook and rod; hooks on one end and rod ("stud") other end. Capacity: 350 lbs. max. distributed live load per 10' section, or 1,300 lbs. per 5' section. Note: Prices in table below are set high. 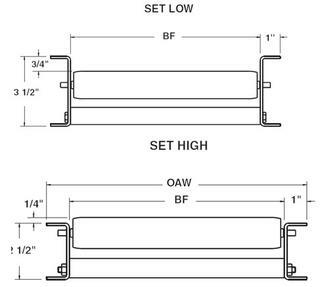 In addition to selecting your conveyor below, select "Set Low" option in Options tab below to order set low frames. Select this option to indicate that you would like your 138G or 138P order set low, instead of high.